An associate of Siberian Federal University (SFU) teamed up with his foreign colleagues to increase the efficiency of the heat transfer medium used in solar power plants. The results of the study were published in Renewable Energy journal. Solar power generation is an area of alternative energy that uses solar radiation to produce energy. Sunlight is a renewable energy source, and the generation process is free of waste and emissions. However, solar power plants are extremely weather-dependent and require a vast amount of space. Still, solar power plants (especially electrical power stations) are used in many countries. 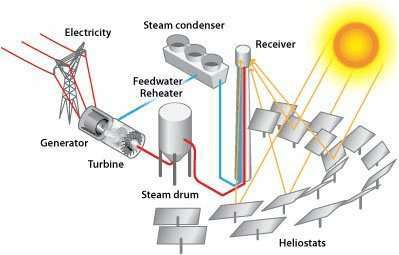 At such plants solar energy is concentrated in reservoirs filled with organic heat transfer medium. It is a liquid that circulates and transmits the heat to a container with water. The water boils and moves turbines which in turn generate electrical energy. Many researchers work on the improvement of the heat transfer medium properties trying to speed up the boiling process and thus increase the productivity of solar plants. The authors of the study added nanoparticles of titanium dioxide TiO2 in different concentrations to a liquid medium consisting of biphenyl C12H10 and oxydiphenyl C12H10O. The scientists point out that they had to take a lot of parameters into consideration, including physical stability. They report that the liquid should keep its physical properties for a long time, and its particles should not precipitate. When the researchers found the optimal composition of the nanofluid, they studied its characteristics: viscosity, density, isobaric specific heat, and heat transfer coefficient. "We've established that after titanium nanoparticles are added to the heat transfer fluid, its properties radically change. With the increase of temperature, the heat transfer coefficient of the base fluid and titanium dioxide particles reduced, but after the nanofluid was prepared, the values started increasing," says Andrey Yasinskiy, a co-author of the work, senior lecturer at the department of non-ferrous metallurgy of the School of Non-ferrous Metals and Materials Science, SFU. In the course of their work, the scientists used optical spectroscopy to determine physical stability of the nanofluid and dynamic light scattering method to calculate the size of nanoparticles. To evaluate the efficiency of the liquid, the researchers made measurements three times a day for 30 days. In particular, they checked for the aggregation of particles, i.e. their agglutination leading to precipitation. When particles in a nanofluid precipitate, the effect from the admixtures reduces. "The nanoliquid we've developed will help generate electrical energy in a more effective way. Naturally, we plan to implement it into industry-specific processes, but the whole work was performed with the use of the equipment provided by our Spanish colleagues, so further development of the study will depend on them. I can't but mention the contribution of professor Javier Navas of the University of Cadiz. The idea of the study was his," added the researcher.